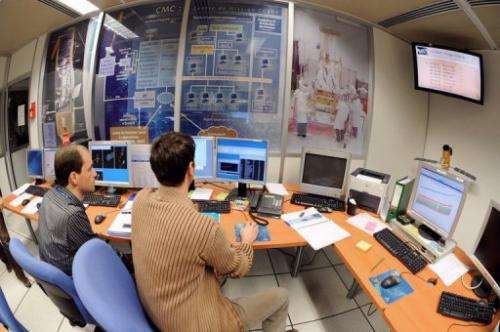 Engineers of the French National space studies centre (CNES) are at work in the room dedicated to the Corot project on December 19, 2008 in Toulouse, south western France. The CoRot spacecraft built to eavesdrop on the music of the stars and detect distant Earth-like planets, will be retired after a successful mission double as long as envisioned, French space agency CNES said Monday. The CoRot spacecraft built to eavesdrop on the music of the stars and detect distant Earth-like planets, will be retired after a successful mission double as long as envisioned, French space agency CNES said Monday. Launched in December 2006, CoRot's on-board instrument stopped communicating with Earth last November after the satellite braved six years of intense bombardment with high-energy, deep-space particles, it said in a statement. "Engineering teams at CNES and the French scientific research centre CNRS have been unable to recover the instrument." CoRot found the first-ever candidate Earth-like world orbiting a star similar to our Sun, and another three just in its first year of operation. Its prime goal was to look for planets made of rock rather than gas—the first requirement along with liquid water and a moderate temperature for life as we know it. The mission of CoRot, executed with a 30-centimetre (12-inch) telescope and two cameras, was extended twice—first in 2009 and then again last year. The satellite was able to acquire ultra-precise measurements, to a factor of one ten-thousandth, of the brightness of stars, said the CNES. "And the resulting harvest of unprecedented results is still far from over, since science teams are still poring over its data." Hundreds of so-called exoplanets have been detected by space probes to date, most of them uninhabitable gas giants. CoRot's contribution was 32 confirmed planets and 100 more awaiting verification. It also allowed the study of "brown dwarves", objects somewhere between a planet and a star, as well as measuring the frequencies of stellar vibrations. The satellite will be placed into a lower orbit before being switched off, burning up on re-entry into Earth's atmosphere. "CoRot's contribution was 32 confirmed planets and 100 more awaiting verification"
I knew about the mission but i only read about 1 or 2 discovories. Since it only has a 30 centimeter telescope I didn't expect much. Apperently the mission was much more successful than I knew about. Hopefully this great beginning wil result in a far more powerful replacement in the future to really show the way towards hundreds of nearby earth like planets.